Update: The Diaz family now has until January 31 to vacate their home, NBC reported. A family in Arlington, Virginia, is going through a difficult ordeal this holiday season. 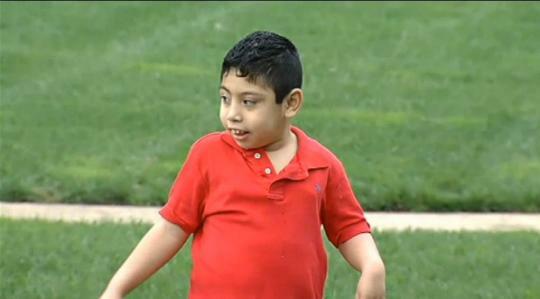 The Diaz family is allegedly facing eviction from their apartment because the building’s management company told them their son, who has special needs, is too loud, NBC Washington reported. The family of four says they were told they have to vacate their home by Jan. 1 after the property manager of Oakland Apartments complained about their 10-year-old son, Elder Diaz. The Diaz family lives in the apartment above the property manager and were told Elder’s shouting and singing is disruptive. Deysi and Fransisco Diaz, Elder’s parents, say their son has developmental disabilities and seizures because he was beaten by a daycare provider when he was just 18 months old. The family notified management about Elder’s special needs when they moved in, and no issue was raised at the time. The Diazes were offered a smaller apartment, a two-bedroom (they currently live in a three-bedroom), that would cost $400 more a month,which they say they cannot afford, NBC Washington reported. Dennis Jaffe, a tenant advocate with the group Buyers and Renters Arlington Voice (BRAVO) said the property manager refuses to give the family a reference, making it even harder for them to find a new apartment. She is only 17 months old, and what she can do will amaze you! Its a shame, but the other tenants have rights too. They are entitled to a quiet life. For the greater good.